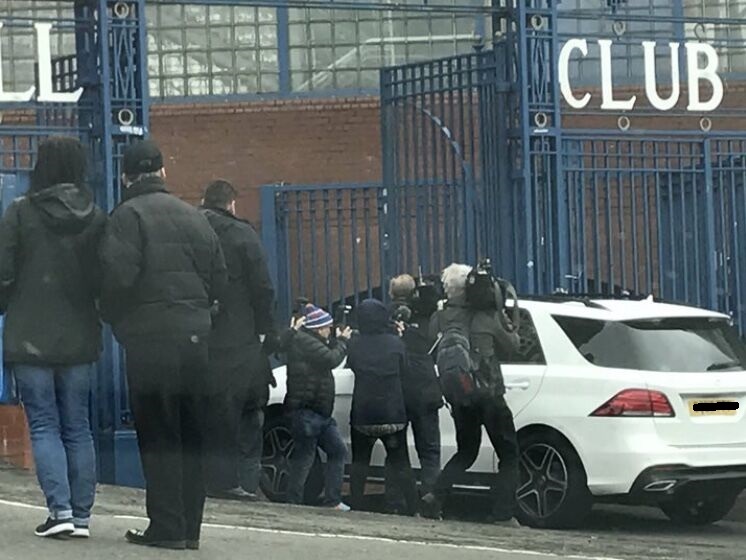 Steven Gerrard has arrived at Ibrox to sign a three year deal, and arrived in a rather modest car, it has to be said! 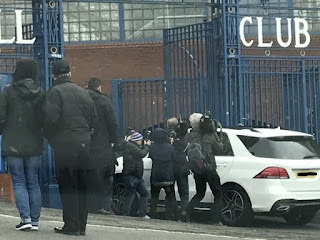 The 37-year old was pictured with his entourage driving into the famous gates amidst a media scrum trying to nab the perfect photo. It is likely no one succeeded albeit not for the wont of aforementioned trying. Sure, this might be Bessie the tea lady coming in for work but somehow we doubt it. Rangers have confirmed a 15:00 press conference at which Gerrard will finally be announced as manager, and the focus on the Liverpool legend is set to be unprecedented, even for the Old Firm. In case anyone forgot, our old rivals sort of won the league last weekend, but this entire week has been Gerrard Gerrard Gerrard. We wish him well in his new role albeit no one can guess how well, or otherwise, it will go. Who in the media do you think will be first to bring up his religion,no doubt our smelly friends from the east will have already researched this,i don't think we will have to wait too long. He is not a catholic, his primary school teacher advised him to go to Cardinal Heenan secondary where her husband was a PE instructor as she knew of the boys ability at football and he would progress there. They don't have to Mate, U have just done It!!!! Religion has nowt to do with it. Its Rangers football club. Good. If he is still practising then he can't be very good. This is a FOOTBALL CLUB. Get a grip lads!If it was the pope who stopped 10 IAR I wouldn’t give a sh**. Let’s stop this right now. Spoke more sense in a 30 minute conference than Warburton and Pedro combined. Matt Busby did well with his first managerial appointment and Stevie G will do the same. Confident and professional. No Surrender. From the off I am in the "hhhhhhmmmmmmm" camp when it comes to signing Gerrard as manager. Now that he has, of course, I will back him 100%, as all Real Rangers fans now should, despite whatever reservations they might have. I WILL say this for the guys... He comes across very well.... VERY VERY WELL!!! Aside from what he says the way he handles himself is unbelievable. As part of my job, both historically and presently, for different reasons, I am qualified in, and continue to study, psychology, NLP and body language. I have just watched his press conference SEVERAL times.... I know he WILL have received training for dealing with the press etc, BUT even with that training you cannot hide Body Language etc fully.... All I can say is WOW!!! He is one smart, driven, confident guy. He FULLY believes in his abilities, everything he said / claimed, he believes 100%. His forthrightness and apparent "honesty" is 100% genuine. One thing I did find funny, that his "body language" did give away a couple of times is the "are you stupid" look, when asked question he felt were either "stupid" or were questioning his beliefs about something he had already answered OR about something he is soooooo confident in, e doesnt believe the question is even worthy. Brilliant. One last thing which is maybe a big plus point.... from that press conference, I believe, the writers from the rags had better watch themselves, I fully believe he will not miss them and hit the wall. Everyone here knows my disdain for King, but that aside.... He is not as keen as he said he was, he is not AS convinced, as his speech was making out to be. That is not to say he was lying with the words he was saying.... He might very well mean them but he just isnt as convinced, but that may be down to the "s**ty mess" he presently finds himself in, to be fair. Allen however..... Wow.... He fully believes. Again I saw now obvious signs of nerves or belief about this move. One thing I do believe I picked up on, and it MIGHT be a reason why King looked a little "nervous" or "uneasy"..... Gerrard and Allen seem to have a very close bond and appear to be very much on the same Hymn sheet. Certainly from that press conference, I am feeling a lot happier about the situation. Aside from that, news is reaching me, that the problem of Gerrard's "inexperience" is most definitely being covered by others. Others who are well and truly experienced. If even some of the things am hearing is true, the board is very much going for it. But like always, I will believe it when it actually happens. On same note, if things are true, be ready for some surprises. Surprises that wont mean as much as a big spend that would normally be required. Just a thought. He's only 37. Go get the boots Stevie and show Broon and Co how a proper footballer plays!